The challenges facing tax departments are mounting. Governments worldwide are scrutinizing companies’ reporting more closely in an attempt to raise revenue. In response, corporate boards and executives increasingly are demanding greater visibility into direct (income) tax positions and their implications. Their goal is to oversee the process more closely. They aim to plan more effectively to minimize tax expense and exposures while mitigating tax risks. In this environment, tax departments need to provide analyses sooner. They must be able to communicate alternatives and their implications to a wider set of stakeholders faster than ever. 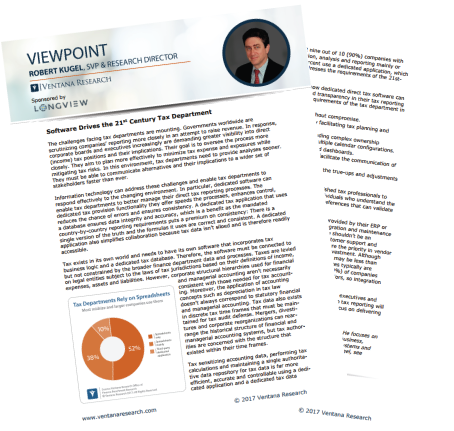 Download the "Software Drives the 21st Century Tax Department" Viewpoint, and improve your finance and tax departments..